Before the Arlington Million, in the years leading up to inaugural Breeders Cup, there was only one million dollar race for older horses in North America, the Santa Anita "Big Cap." All of that changed in 1981 when Arlington Park President Joe Joyce announced that Arlington Park was going to host a new race called the "Arlington Million" to be run in mid to late August. The race was written for three-year-olds and upward to go 1 1/4 miles on the turf course for a purse of a cool $1,000,000 with weights assigned under handicap conditions. American horse racing proponents had long been looking for a way to draw top-level horses from Europe to compete with the best in America. By offering a million dollar purse and scheduling the race during the summertime, some top European owners and trainers took the bait and agreed to support the race under the proposed conditions. The inaugural race was scheduled for August 30, 1981. Among the entrants for the race were American turf hero John Henry with the legendary rider Willie Shoemaker plus a supporting international cast that included top European horses Madame Gay, DC International winner Argument and Kilimanjaro. After torrential rains, the course came up soggy by race time. While despising the track conditions, John Henry made a furious charge in the stretch to catch fellow-American The Bart at the wire. The race still lives as one of the great moments in North American horse racing history and assured the Arlington Million would be a fixture for years to come. Through the years, turf champion after turf champion has made the summertime pilgrimage to Arlington Park for a shot at the winner's portion of $600,000. Past winners include Tolomeo (first European winner - 1982), John Henry (only two-time winner - 1984), the great race mare Estrapade (only filly/mare winner - 1986), Manila (1987), Dear Doctor (French superstar - 1992), Silvano (from Germany - 2001), Cape Blanco (from powerful Tabor/Magnier barn in Ireland - 2011) and last year's upset winner Hardest Core from the USA. Note: In 1985, a fire forced the race to be run at Woodbine in Canada. Also, the race was suspended 1998-1999 while Arlington underwent a facelift. In 32 renewals of the Arlington Million, the race has never been graced by the entry of a Kentucky Derby winner. That is all about to change in 2015 as the connections of 2014 Derby winner California Chrome have stated their intentions to enter the race. Ever since the Derby champion won the Grade I Hollywood Derby on turf in late 2014, the connections (owners Perry Martin and Steve Coburn, trainer Art Sherman) have wanted to get him back on turf to find out if that's his calling. After beginning the 2015 season with second-place finishes in the San Antonio Stakes at Santa Anita and Dubai World Cup in Dubai, California Chrome was sent to England with the intention of running in the Group 1 Prince of Wales's Stakes on turf at Royal Ascot in mid-June. When a minor setback interrupted his training, they decided to send him back to America to look for an alternate race. 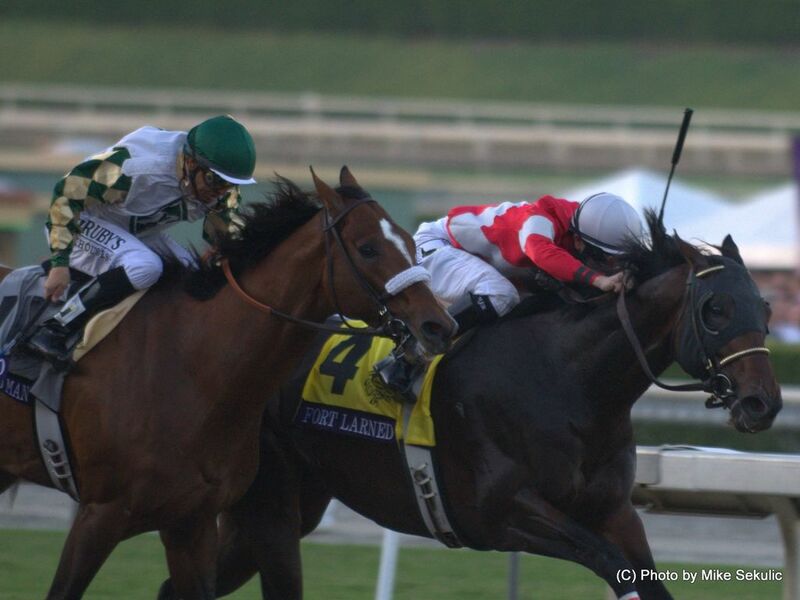 As it turns out, the Arlington Million fits perfectly in the Derby champ's plans. His main competition figures to come from Grade I UN Nations winner Big Blue Kitten and Grade I Manhattan winner Slumber. For the latest horse racing results, horse players can find a variety of sites that provide race results today and everyday races are run. Whether you make your wagers through an online race book or at the track, it's easy to find these race results today. For this year's Million, you can make your wagers and check back later for all available horse racing results.